Headlines: The fishing over the last week has been great in the rivers. Tantangara fished vey well in the Fly Championships, Eucumbene is producing a few on the troll and bait. 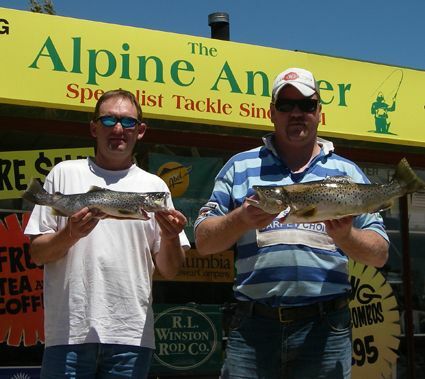 Jindabyne has fished well early and late in the day. 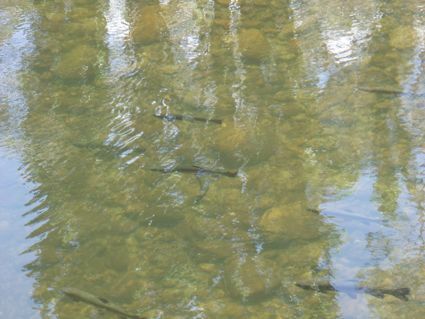 The NSW government has proposed early last week to close the Gaden Trout Hatchery at Jindabyne. Of course this has angered many anglers in the local area interstate and even overseas. Petitions to stop the closure are in the shop at present and all anglers are urged to sign. 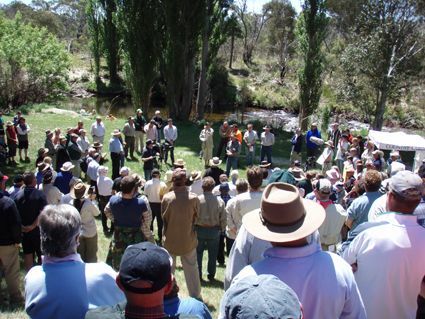 A hastily organised rally was held at the hatchery on Sunday and the turn out was very good. Steve Samuels, president of the Council of freshwater anglers spoke along with representatives of the main political parties. None want the hatchery closed. Rally at the hatchery on Sunday. If you want to help avoid this ridiculous proposal you can write or email letters to the following people to voice your disapproval of the proposed closure. Rivers:- Dry fly fishing has been exceptional in the local area with the fish really looking up for anything hatching or falling onto the water. With one week of warm weather the fishing has improved out of sight. Beetles are starting to show, more caddis are hatching from the streams, and the whole area has been firing. The Murrumbidgee has produced some great fish in the Fly Champinships and some good ones at that. Lake Eucumbene:- Looks fantastic at present and the water is still rising but the fish have not been coming in around the edges in big numbers yet. With the edges warming and the Midges and Caddis numbers rising it won't be long before it really fires up. Evening is the best time to hit the lake for rising fish. Early polaroiding can be very succesful on browns when conditions are good. Lake Tantangara :- Have not heard the full report on the fly championships at the lake but I did here of some good fish being caught out of the boats. Our Rapala Minnow indent has just arrived this week. *Russel Job and Justin Perrin from Young caught these great browns on Sunday. No details as to what on but great fish all the same. 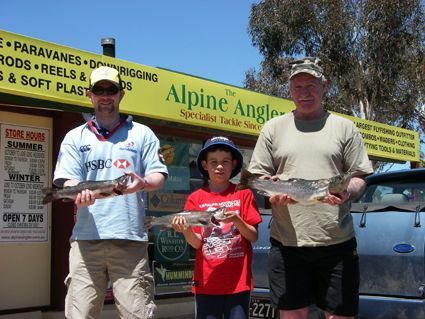 *Lucas, Dave and Brynn Atkinson fished Jindabyne for these nice fish on grubs and Powerbait. Photo below. *Rob from Bega caught six rainbows on powerbait and scrubbies last week. Fish were between 40 and 46cm.